1987 saw the arrival of seven new games, and among them, two are particularly worthy of attention. The first operates on the hottest 8-bit computers and is called Barbarian. 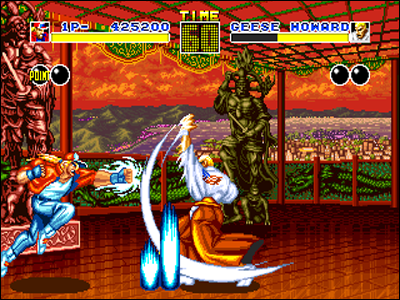 It includes swords, and for the first time the gore makes its appearance in a fighting game: it is possible to violently cut the opponent's head, sending it rolling on the floor. It siply requires to perform the proper manipulation in the right tempo: awesome! All players will want to try this primal art of slicing heads, evidence that malsaint and bloody content have a great future in the genre. The game is a bit steep and there's a small amount of different warriors, but the fun is there and the soft experiences a great success. Barbarian, respectively for Amiga and Amstrad CPC. 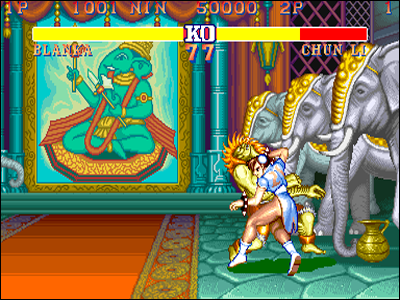 In parallel, the other flagship title that makes some noise in the arcades is Street Fighter from Capcom. Created by the great Takashi Nishiyama, the game offers the players to embody a red head Karateka with (Ryu) who travels the world to compete against the best fighters. here again, the game is super stiff and controls leaves a lot to be desired, but you can perform special moves such as fireball (the first hadouken!) and the legendary Dragon Punch. 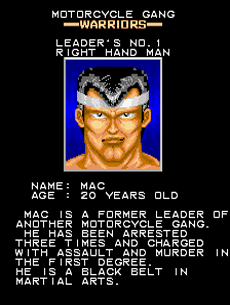 In addition, the graphics are remarkable for a 1987 game, and Capcom makes sensation with its dedicated terminal, equipped with gigantic buttons that can be hit strongly by the players. The game builds its gameplay shamelessly around Yie Ar Kung Fu's basics and brings more details, without innovating much either. The genre evolves in the right direction, despite a still quite crappy gameplay. If we look more closely at the games coming out in the wake of Street Fighter, Capcom is already holding a great recipe with its game, as most editors are eager to use for theirselves the themes and mechanisms from it. Since 1988, some VS Fighting standards are already well established in the programmers' brains. 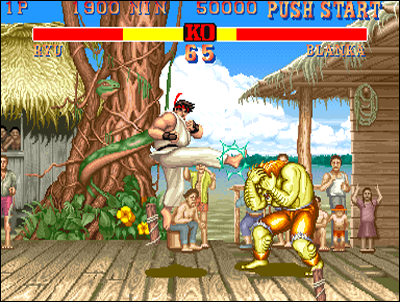 Combat on a single line, jumps, life bars and special moves, possibly combos... and the possibility for the player to choose among several fighters different from each other, mastering various more or less known martial arts. So are coming some more or less successful clones, as Fighting Road, Fuuun Shaolin Kyo or the opportunistic Double Dragon - VS version of the famous Beat them Up - for the NES. It features six playable characters, and it's the first game to feature dash during combats. Some adventurous firms deliberately deviate from these standards by trying to include 3D gameplay, ie allowing movement in depth and not only on a single horizontal line. This configuration was then used with Beat them Up, which range of moves and use of the stick didn't required further manipulation than moving move. 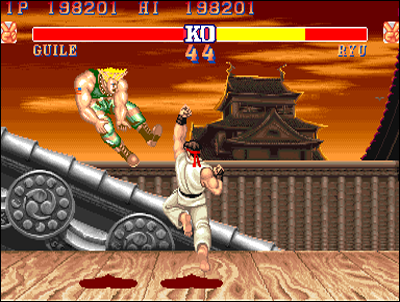 Subsequently, this parameter was then neglected by most editors, until the advent of 3D because of the important stick manipulations during combats (ducking, blocking, jumping, half-circles to perform special moves) as well as the precision required with blows proving incompatible with lateral movements. In addition, this demonstrated to bring nothing interesting in terms of gameplay. 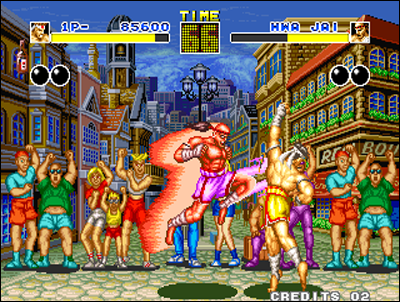 Always it is that SNK and Taito rush into this impasse in 1989, respectively with Street Smart for the first, Ka Ge Ki and Violence Fight for the second. Those were well-made and fun games for the time, but clearly showing the limits of this configuration compared their 2D-gameplay counterparts. 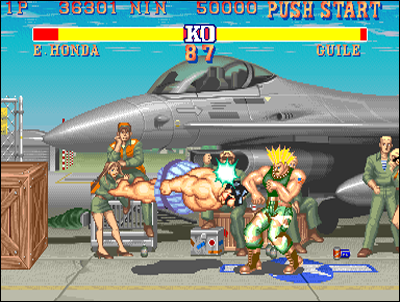 Both titles are experiencing a relative success and in 1990, it's the famous Pitfighter which again uses the '3D' gameplay and triggers a lot of enthusiasm among arcade players. 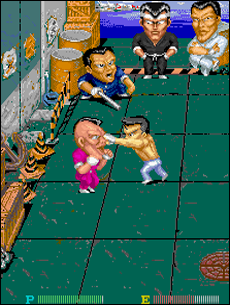 Violence Fight, the first VS Fighting game featuring huge sprites! With Street Smart, SNK is not yet at its best! The plebiscit is palpable; not only arcade fighting games are experienced a huge popular success, but the editors provide every year more and more quality to their creations. In the early nineties, Shoot em Up, Beat them Up and Versus Fighting hold the upper hand: these are the most popular genres in gaming rooms, and they are regularly adapted to consoles and computers. 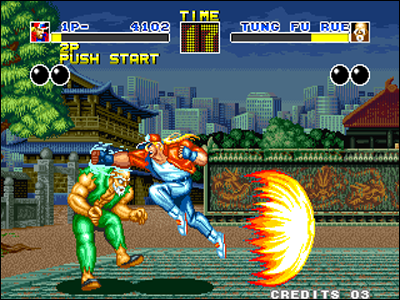 Amateurs of this genre have the choice among a wide range of games, proposing gameplays as various as confused, and the most popular titles - at the dawn of this year 91 - remain the legendary Konami's Yie Ar Kung Fu and Capcom's Street Fighter. 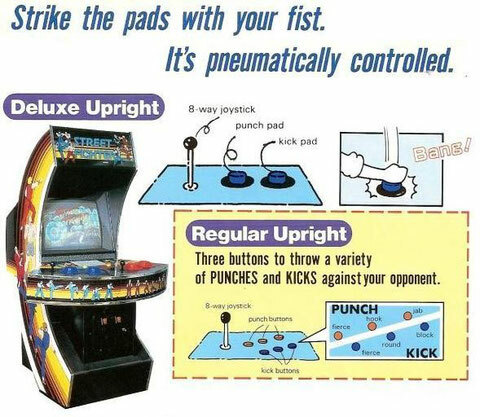 Meanwhile, 1990 saw the arrival of Panza Kick Boxing on the computers. The game was nothing spectacular, but included a wide range of realistic and varied blows. This remains a subdued vintage, very quiet since 1985's mini-euphoria, with only four new titles at the counter the year, all media included. In fact, the year 1990 was only the calm before the storm! What awaits players in 1991, it is a real tidal wave that will blast everything that was known in VS Fighting. Capcom was working on a sequel for its game since several years, and people will then easily admit a long gestation (no less than four years ...): Street Fighter II was released in March in the arcades. The soft doesn't have much to do with the first game, as there's a tremendous technical gap between them! Sumptuous graphics (the best ever seen in a fighting game so far), incredibly fluid animation, fast and flexible moves, a demonic soundtrack galore of digitized voices... CPS hardware is fully exploited by programmers, the result is simply impressive. Not only the game provides a realization that simply sweeps the competition, but it also pushes the nail on its intrinsic qualities: eight playable characters - amazing at the time -and four Bosses to face, in addition to other opponents you have to beat to clear. 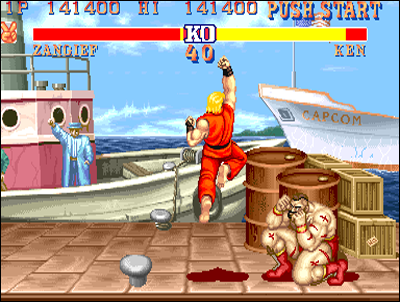 Three levels of punches and three levels of kicks are used, guard, life bars, special moves, combos, a perfectly balanced difficulty and two-players versus... Street Fighter II has it all. 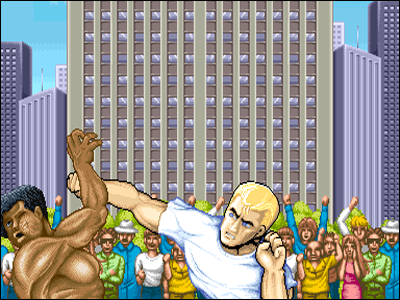 It's very simple, players who tried it simply erased past fighting games from their memories: it is a monumental slap. Capcom makes big, big money with its hit that conquers the world, and definitely popularizes the Versus Fighting genre. 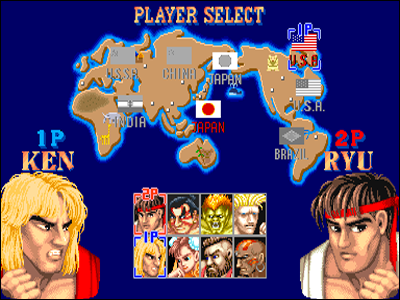 Street Fighter II blasts the competition in 1991. This year, only SNK manages to look not totally ridiculous face to Capcom and its mega-hit. The editor has left far behind Street Smart and took Takashi Nishiyama -Street Fighter's dad - for developing its new VS Fighting game on Neo Geo: it's Fatal Fury. 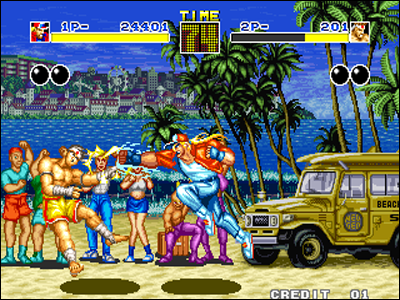 Based on a scenario of vengeance around a martial arts tournament, the game features charismatic characters and endearing places. The frame is very good, realization excellent and gameplay light years ahead of all what've done before - except of course for Capcom's SFII. 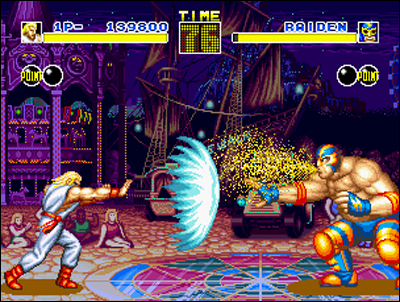 The game features three selectable characters and eight fights against characters controlled by the CPU, not to mention the confrontation between players and the ability to play two against the machine! 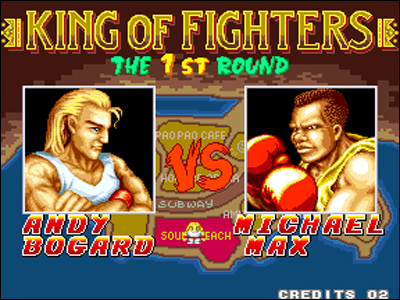 It is a remarkable title in 1991, but Fatal Fury comes in the wake - and the shadow - of Street Fighter II: the competition is fierce, and if SNK's title experiments a relative success, it can't rivalize with Capcom's Mega-Hit... which decidedly shows above anything else. 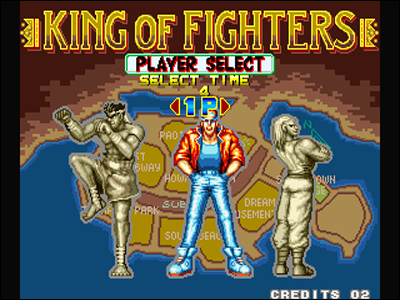 Capcom started the shift change and SNK follows it better than all other competitors, but the editor of Street Fighter II took a serious step forward with this game. This lays the new basics of Versus Fighting and sets new standards. The success is such that there are no more questions to ask: the recipe works perfectly, this is what the players want! And as usual, a crowd of editors will attempt to step into the breach. The year 1992 is sort of a 'court of miracles'. Everyone tries his luck, videogame creators want their part of the cake and it gives rise to quite a few heartbreaking attempts. Each editor claims its own Street Fighter II, and of course, few have the talent of Capcom's people. The knives are featured with two 'Barbarian-revival' Blandia and Battle Blaze. 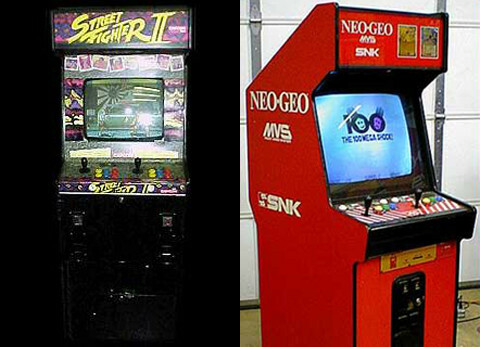 One was released in arcade, the other on Super Nes. Despite decent realizations, these lack the essential: a successful gameplay. And for SFII has set the bar so high last year, let's say that these games didn't pass the crash-test successfully. It's the same for most softs published in 1992, such as Deadly Moves, Doomsday Warrior, Time Killers or the incredible Dino Rex, featuring battles of huge anemic dinosaurs on an Taito's idea , which completely misses its come-back in the race.